Hello MCC Churches and Communities! Indeed, “The Joy of God is our Strength!” The 2019 conference scripture reminds us of a time of holy reunion, when the Israelites returned to Jerusalem after exile. Ezra declares God’s love for the people even when they feel disconnected from God. We will have a holy reunion 1-5 July 2019 to celebrate the birth of Metropolitan Community Churches which began in a humble living room made full with an unquenchable Spirit. This same Spirit has guided MCC through moments of surprise, grief, victory, and devastation. Like the Israelites, our tribe has seen and experienced many things, but the same Spirit that connected the 12 in Rev. Troy Perry’s living room, the same Spirit who guided the 12 disciples, is the same Spirit who calls us together today in our churches all around the world. As we prepare to Celebrate MCC’s 50th Anniversary, we hope that you will share the stories of your church and community. There are many ways for you to contribute. We look forward to hearing ideas your ideas! Our 50th Anniversary will culminate in a worldwide celebration at the 2019 General Conference in Orlando, Florida, USA 1-5 July. Registration is now open! We are currently offering a special promo rate. Rates will increase 1 May 2018. So, Register today and encourage your congregation to do so as well. We especially want to highlight some of the changes to programming at this General Conference! Sunday, 30 June, evening: Conference kick-off with a big celebration/party. Monday: Morning plenary that will focus on MCC’s history and impact. The business forum will be Monday afternoon. Thursday: Workshops and plenary sessions with content based on the survey data collected earlier this year. Friday: Morning will feature a giant resource fair. We will close the conference with a late-morning worship service and after there will be buses available for optional excursions to area theme parks. This October we will launch our Anniversary celebration. Founders MCC will host a week of events that will include a Gala on the night of MCC’s 50th Anniversary, 6 October 2018. The week will be full of events that precede and come after this affair. Make plans now to attend! The same weekend will kick-off a 5-week Anniversary Worship Series that will focus on the history and legacy of MCC. This series is being curated by over 20 worship leaders, writers, and musicians and will be released on Pentecost. Leave room in your congregation’s worship planning to make use of these materials! In addition to these amazing things, we will also be launching a storytelling campaign. In collaboration with the 50th Anniversary archival project and General Conference, this story-sharing campaign will be in the style of the first worship service in Rev. Troy Perry’s living room. The original order of worship from that service will be adapted so people can share MCC stories in groups of 10-12 individuals. Our hope is that these stories will be collected online after the storytelling campaign and shared with people around the world leading up to and during General Conference. The resource kit for this story-sharing campaign will launch with the Anniversary worship materials on Pentecost. 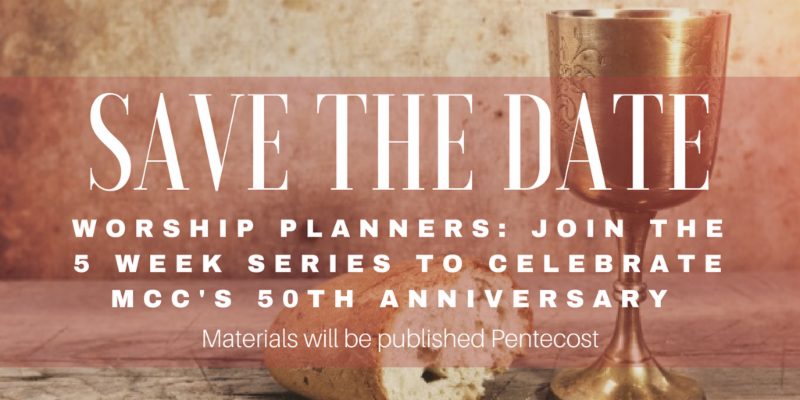 We hope that these materials and activities can help us feel more connected as a Global Church while we get ready to celebrate 50 years of history. If you have any questions, comments, or ideas, please let us know!